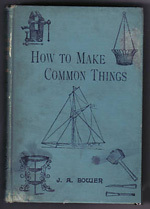 Loving the latest addition to my vintage craft library … How To Make Common Things (for Boys). Written by J.A.Bower and published in 1902 by the Society For Promoting Christian Knowledge, this was obviously an attempt to keep the male youth of the day on the straight and narrow (idle hands and all that). There’s also a note that it was ‘Published under the direction of the General Literature Committee’ – how very Orwellian. I’d love to know what kind of age-group it was aimed at – I imagine early teens, as some of the projects are quite involved: ‘How to Make Simple Apparatus for Chemical Experiments’, ‘To Make a Galvonometer’ and, fascinatingly, ‘How to Make A Telephone’. Mind you they weren’t so hot on health and safety then, so maybe there were some scarred-for-life 7 year olds out there (all in the name of religion of course).